I’ve been wondering lately: With my busy personal schedule, how can I plan to squeeze in a few hours of mtrek every-now-and-then, and have the highest chances of encountering other human players? Since this server first came to life, I’ve had a sense that certain hours of certain days are busier- and scrolling through endless pages of raw data, (inbound-connection logs mostly) my suspicions seemed to be confirmed. Clearly, most of us have typical Western-Culture Mon-Fri (work) weeks and unsurprisingly, Friday, Saturday, and Sunday are the days we have the most free time for things such as online gaming, which means of course, that those are the busiest days on mtrek. I decided to take it a step further, and organize the data by day of the week. Measuring overall server traffic is somewhat telling, but the sheer number of hits from bots, crawlers, and (don’t worry, it’s normal for any public-facing server) attacks- obscures the important piece of info: That is, when do people actually log into the game? So I redefined my search parameters and turned to the game’s database for more clues. As I mentioned above, this chart captures only confirmed occurrences of ships being logged into the game. Connecting to only the welcome screen, doing a “who” or “who -l”, etc was not counted. This data was collected during the time period from April 20th through September 20th of this year. All of the timestamps are recorded by the server in Eastern Standard Time. The first column lists each hour of the day on a 24-hour clock. 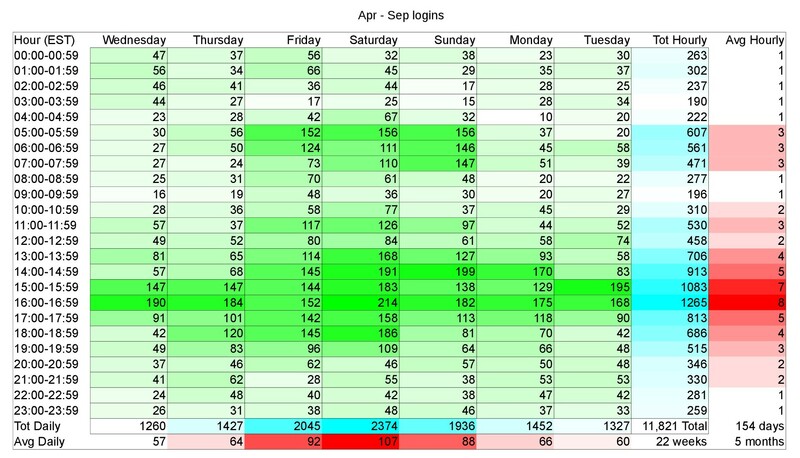 The next 7 columns (obviously) represent days of the week, with the total number of connections that occurred during each hour of each day throughout the entire 5-month period. The “Tot Hourly” column is the total number of connections that occurred during each hour of the day, regardless of day of the week. Finally, “Avg Hourly” is the average number of connections per-hour, regardless of day of the week, rounded [down] to the nearest whole number. Similarly, the last two rows show the total number of connections per day of the week, regardless of hour of the day, and then of course, average connections per day of the week, regardless of hour of the day, rounded to the nearest whole number. The intersection of “Tot Hourly” and “Tot Daily” shows the total number of connections during the 5-month time period: 11,821. A simple color scale was applied to each data set. I should also point out, that as a (visible) pattern began to emerge, I decided to slide ‘Wednesday’ all the way to the left, and then moved ‘Sunday through Tuesday’, to the end. There is a “band” from around 3pm-5pm every single day of the week with higher activity levels. I think this can mostly be attributed to a couple of players who play almost every day. There is a “blob” on the weekends around 5am-8am, which I believe can be attributed to some of our friends in Europe, who are normally 9 or 10 hours ahead of EST. 4pm-5pm on Saturday is the most active hour of the entire week, and 4pm-5pm is also the most active hour of any particular day, with the exception of Tuesday, when 3pm-4pm is the most active hour. [edit: somehow missed that Sunday also has a busier hour from 2pm-3pm] 3pm-4pm on Tuesday also happens to be the 3rd busiest hour of the entire week. On any given day, playing from 3pm-5pm gives you the highest probability of encountering another player, while if you must pick only 1 day to play mtrek- Saturday, followed by Friday and then Sunday, will be the “ideal” days to log in. If you have less flexibility for your weekend gaming sessions, you still have a really good chance of running into someone during any given hour between 1pm and 7pm, Friday through Sunday, or you can try to catch the early-birds between 5am and 8am on the same days.